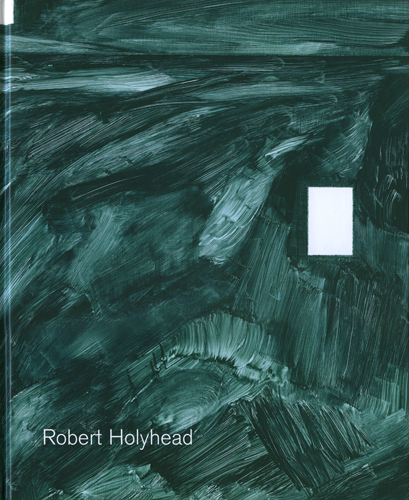 British painter Robert Holyhead works mainly on delicate small-size formats covered with semi-translucent colours. Most of the time, traces of brushstrokes remain visible and form floating geometric shapes, while some parts of the canvas are left uncovered and oppose an immaculate white to the coloured variations. The elaborated edges of the shapes play with the balance between negative and positive spaces. The intimacy of this gestural fluidity comes from a precise and disciplined process devised by the artist both on his works on paper and paintings. "I pick up on things that are a little bit peculiar and that exist awkwardly in the world, that are already abstract. It's much more to do with seeing something which becomes abstract in my mind over time before becoming a motif in the studio or eventually a gesture or form in a painting. I'm not so sure how they come in or where they have come from. My work doesn't have any particular reference points outside or itself yet external influences creep in as I make it. As such, my painting presents both a type of personal language and some familiarity with the world."